Bound for Success (BFS) provides one-on-one tutoring, as well as sports and recreation, to 30 homeless children at a time — upwards of 100 girls and boys over the course of the year. Every day after school — and from 9:00 a.m. to 3:30 p.m. during the summer — BFS opens its doors to a brightly painted oasis of learning and fun, worlds away from the grim realities of daily shelter life. The BFS curriculum is built on consistency — something often lacking in homeless children’s lives. Each afternoon starts with an hour of tutoring to help students attain grade-level academics in literacy, math and problem-solving skills. The remainder of the afternoon is given to creativity, the arts and physical play — including writing poetry, short stories and plays, along with singing, acting and learning about music. Before the kids depart, BFS staff touch base with each child’s parents to assess how his or her family is doing and offering additional support as needed. 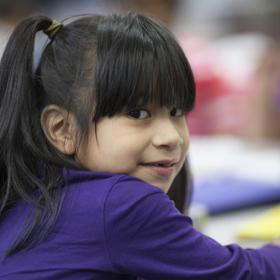 We connect families with other CFH programs and resources throughout the community to ensure children thrive — inside our classroom and out. While education is a crucial part of the program, we also provide a safe haven for homeless youngsters to have fun, make friends, and be physically active. Field trips are often a highlight, since all our kids come from families with limited resources. Staff accompany children to museums, sporting events, and holiday parties organized by the Coalition.